"Earning your trust, understanding your goals and providing knowledgeable answers." Knowledgeable approach: Worthwhile goals take time, planning, ongoing coordination, and clarity to help achieve. With more than 10 years of experience in financial services, Theresa has experienced a variety of economic and capital market conditions. Together with her MBA and her Certified Financial Planner designation, Theresa is committed to creating balanced, high quality, diversified portfolios where risk is controlled and opportunities are exploited. Understanding your goals: Theresa builds relationships for life, with the goal of helping clients implement and maintain accurate investment and wealth plans that evolve with their life plans. She does this through one-on-one meetings, client education, regular review and monitoring, and ongoing sound advice. She draws on the depth of resources available at TD Bank Group, and from external specialists to help take advantage of opportunities and changing conditions. Trusted Advice: Helping her clients achieve their financial goals is her top priority. The majority of her clients have worked with her for many years. They have rewarded her with their loyalty, support, and they have referred their family and friends over the years. Her business grows through referrals and she work hard to earn that privilege. - There are several investments available today and the markets have changed. What options do I have? - Will I have the income that I need available to me when I need it? Do I have enough saved? - Is my wealth well diversified to help reduce my risk of loss? - Do I understand what I'm actually invested in? - Am I paying a fair fee for the service that I am receiving from all parties? 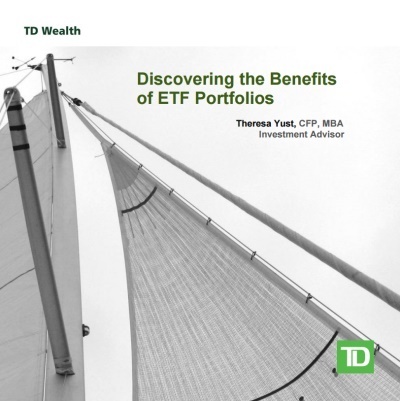 Theresa believes that exchange-traded funds (ETFs) can provide the optimal investment vehicle in addressing these concerns. The booklet below the wheel will discuss and explain the top four reasons why using ETFs might be a suitable choice for you, depending on your individual circumstances, goals and risk tolerance.